Central Queensland University, Melbourne Campus, Australia. To meet the demands and expectations of increasing global competition, contemporary accountants require a range of generic skills such as analytical and problem-solving skills, personal and interpersonal communication skills, management, negotiation and organisational skills, together with the ability to apply these skills in a range of unique situations. 21st century technology is needed in teaching, learning and applying these skills in a contemporary environment is becoming imperative. Teaching and learning strategies should move away from procedural tasks and memorising professional standards towards more conceptual and analytical teaching and learning. Significant technological innovations, including the Internet, provide most effective communication tools that have gained increasing popularity. This paper primarily focuses on educational blogs as an engagement and reflective tool for accounting students and how they can improve educational outcomes for accounting students. The pedagogical importance of student engagement and of educational technologies in teaching and learning are discussed. Educational blogs and how they can be used as a reflective assessment tool in accounting education are then discussed, Finally the role of educational blogs in accounting education is illustrated then evaluated. Keywords: Educational blogs, online learning, blogs, edublogs, reflective learning, accounting education. Technological innovations are changing the professional environment in which today's accountants work. The role of an accountant is moving from a normal financial accountant to a financial analyst and management accountant, requiring a broader set of knowledge, professional aptitude, critical thinking skills, and decision making capabilities than prior generations. Technology has influenced all aspects of an accountant's professional life. Individuals entering the profession must understand the current and future roles of information technology in organizations. Some accounting bodies and business thinkers suggest that the accounting profession should be entirely restructured (Nelson ,1996) . Many of the current accounting practices are no longer relevant as computer-supported practices have effectively replaced them. In order to meet the professional expectations in this changing scenario, the profession has called for significant change in accounting education and training of accounting professionals. The Institute of Certified Accountants in Australia suggests that fresh accounting graduates must equip themselves with necessary skills to use technological tools effectively and efficiently in order to match market expectations and to enhance their professional competence (CPA/ICAA, 2009). Singh and Pan (2004) support the incorporation of online technology in business education in the times of increasing professional expectations, increased availability of technological tools and their usefulness to enhance student learning; and state that the use of technology can be as good as, or even better than, quality than face to face sessions as a tool for delivery and assessment. The research conducted by Alavi, Yoo, & Vogel (1997) and Dutton, Dutton, & Peery (2001) support the viewpoint that online education facilitates better course delivery and improves student-learning outcomes. The changes in the accounting profession require accountants to gain skills in using computers, accessing online information and working independently on computer-assisted professional tasks. Innovations in technology can be used in enhancing existing teaching and learning tools in the classroom in order to facilitate the development of computer-related competencies in accounting graduates. The use of Internet technology allows accounting students to explore relevant information and to relate such information to accounting concepts and other business information they wish to examine. The use of information technology for peer communication and discussions enables students to build upon existing knowledge structures and permits them to interact freely with information. In addition, technology allows students to have control over their learning environment and to act as self-directed learners, promoting more active learning. Good teaching has been associated with the provision of a supportive, personal, learning environment; engaging students in the content of the unit; encouraging active participation and providing quality feedback (Ramsden, 2003). Ramsden’s student learning approach in relation to learning context can be seen in the following diagram. Considerable contemporary research suggests a link between good teaching and a deep orientation to learning which enhances student learning, critical thinking and higher order learning (Trigwell & Prosser, 1991; Kember, 1996; 1998; Biggs, 2003). The learning context is one of the major influences on whether a student engages in deep or surface learning (Biggs, 1989). Ramsden (2003) states that there is a difference between simple conceptual knowledge and higher-order learning and critical thinking. Class-based lectures have been a traditional learning context in university education as they enable an efficient delivery and transfer of information to a large number of students. However, the lecture approach has also been subjected to strong criticism as it provides a passive learning environment and its ability to foster deep learning outcomes is questionable. Ramsden (2003) in his model articulates how 'good teaching’ helps students to understand the ‘essence of scholarship’. This is achieved by providing opportunities for students to ‘learn and practice the art of inquiry’, ‘deep order learning’ and ‘reflecting learning’. Ramsden takes the process of engagement a step further where the learner has scope for creativity in individual expression and freedom to choose the time and method of learning. 'Diversity' is also an important part of engagement - both in the range of activities offered and also in recognition that the student groups are diverse. Elements that impact on student engagement in higher education include relevance, timely feedback, individual and social construction of knowledge, social presence, community and reflection. Education research on designing learning environments that optimize learning have been identified as being learner-centered, knowledge-centered, assessment-centered, and community-centered (Coutinho, 2007). The present day learning theory values interactivity, application of prior knowledge, connecting the theoretical to the real world situations, and using relevance and efficacy to assess information. There is a fundamental shift in the educational paradigm from instruction to construction and delivery. Learning is not simply assimilating knowledge transmitted by textbooks and instructors but personally building and communicating knowledge. In student-centered learning environments teacher’s role has changed as the learning approaches shifted from instructivist to constructivist (Harada, 2003). From this constructivist approach, a teacher is the person who creates the challenges for students and seeks their active and involved participation in the learning process. The student groups have changed radically across the globe with the growing developments in the technology sector and available communication tools. They are surrounded by computers and technology assisted videogames, mobile machines which they use for mutual and group communication and all their social and educational needs. Increasingly, net generation learners will require that educational institutions provide technology-rich learning environments which will provide them an easy access to the learning materials, online assessments, communication with their instructor and their peers (Prensky, 2001). In this aspect, educational institutions have needs for their students to provide technology-rich learning environments supported by the use of latest communication tools provided by information technology. A Learning Management System would ideally include various online tools such as blogs, discussion boards and chat rooms. The process of thinking about affordances offered by different student engagement tools shows/demonstrates that an engagement tool can do many different things as it is best suited to certain tasks. Synchronous discussion for instructions, questions and organising collaborative work and spontaneous discussion. Blogs could be easily used for cooperative project work where each person independently completes a section of the project. The individual tasks can be allocated by the teacher or negotiated within the group. Either way it is a cooperative process not a collaborative one as cooperative learning is defined by a set of processes which help students interact together in order to accomplish a specific goal or develop an end product which is usually content specific It is more directive than a collaborative system of governance and closely controlled by the teacher. Sullivan (1996) states that cooperative learning is a teaching technique that develops problem solving and critical thinking skills through student team work. The use of educational blogs for student reflections is one of the few activities that show developing critical thinking and social engagement in a diverse student cohort. This medium will allow the students to connect to their teacher and also with one another. The authors believe that reflecting on classroom learning and then writing about it helps retention too. Blogs are gaining popularity because they are relatively inexpensive to set up, easy to maintain and easy to use. Blogs allow users to publish posts that are sorted in reverse chronological order. Text, graphic images, informational links, and other data may be added. Blog posts can be edited by the creator at any time and allows its readers to leave comments for the original posting and to each other’s comments. Thus they can be seen as means of facilitating discussion through ongoing commentary. The layout of the blog page can be tailored to suit the author or the blogger. Blogging goes through a series of post and comment cycles and can be considered iterative in character. The iterative character of blogging allows for explanation, clarification, and further discussion whereas a physical journal may not allow for this iteration and may devour a lot of time as well. Educational blogging may include blogging by students, teachers, administrators, industry experts, and other involved entities that focus primarily on the educational process and educational interests. Edublogs are written by anyone with a vested interest in education and its outcomes. Edublogs can be written by teachers for the improving classroom instruction, by students to post their assessment tasks, and by policy makers who need to comment on education. Educational blogs allow all students to partake in discussion on any topic. Williams & Jacobs (2004) have concluded that academics have been a little slow in exploiting the power of blogs and it is still a grassroots phenomenon. Blogging has great potential for advancing accounting education since it encourages discussion and debate. It can be seen as an extension or complementary approach to existing ICT approaches, course websites, discussion boards, and multimedia presentations in the accounting discipline. Farmer (2006) has argued that blogs restore a vital sense of individual empowerment and validation that is not present in many of the other existing ICT approaches. Accounting teachers can adopt blogs as a means of changing their content delivery approach that will enhance and encourage asynchronous participation. The asynchronous nature of blog contributions and an opportunity to analyse and edit each other’s work may allow a less contributing student to make a significant contribution to the assessed outcomes. This asynchronous written mode of contributions also encourages students from diverse locations and widespread backgrounds to take a more active role in the project Blogs will allow students to gain both technological and discipline knowledge that will help them in their careers. Blogs are an effective means for delivering discipline content as it will help to develop informative practices that are “constructivist, interactive, collaborative, learner centered, and just in time” (Wonacott, 2001). With the increased use of technology tools in education faculty members have been using blogs by integrating them into their courses to enhance class discussions or as a part of course assessments. The researchers in business education have supported the use of case studies involving the use of blogs in a single course. The authors (Glogoff, 2003; Quible, 2005; Ducate & Lomicka, 2005) in a study, conducted at a business university, assigned a similar blogging exercise in three different courses—in order to introduce students to the use of blogs in their respective disciplines and to help students prepare for meaningful classroom discussion. The findings of the study proved that with the blog posting of discussion questions and reflections after completing the required readings on the relevant topics of interest to which their classmates can respond through their blog postings. This exercise provided a beginning of a healthy conversation prior to the class session and the students became more engaged in the learning process and the course material. This exercise required students not only to read the required course materials but also to engage with them critically in order to move beyond a general conceptual understanding of the materials. By using the same assignment and assessment tool, the authors found that blogs can be effective in enhancing class discussion in a range of disciplines and in integrating liberal learning into professional programs. Further, in promoting interaction with others, the use of case studies provides opportunities for an active and interactive consideration and discussion of issues. Active discussion and collaborative participation by teacher and the students should be a core teaching strategy in the case study environment, thereby promoting communication and interpersonal skills. Students may be encouraged or required to communicate their views to a group, defend their position, consider the views of others, and present their conclusions, orally or in writing, to others. Many educational institutions are including a blogging assessment activity in their courses, as they help to promote communications skills in a unique way. (Madigan, 2006) Blog posts can be compared, contrasted, and analyzed allowing students to enhance their understanding of the discipline and its application in real life situations. Culley (2006) has mentioned the best use of blogs as being for personal reflections and chronological records. Personal reflections on cooperative project work will allow individual students to complete their own activities whilst maintaining a chronological record of the activities allowing for easy traceability that helps an individual to read the history of or the process of the project development. Educational blogs are used as a communication tool by educators, students, and education administrators to interact more effectively .These blogs offer an environment that extends learning outside the classroom domain and help the students to share their opinions, experiences and everything they want to share with other group members and their instructor. Besides, students and instructors can add their comments to contents of a blog which could be followed in a chronological order. Huffaker (2005) concludes that blogs can be used in any discipline, whether it is arts, computer education, sciences, or accounting. The process of forming a community of learners is an important issue in technology supported learning environment because it helps in improving student satisfaction, retention, and learning as they actively participate in the online interactive activity, contribute their thoughts, learn from ideas posted by others and develop a deep understanding on the relevant topic. Key attributes for accountants currently practicing are said to include a range of generic skills such as analytical and problem-solving skills, personal and interpersonal communication skills, management, negotiation and organisational skills, together with the ability to apply these skills in a range of unique situations (Bellamy (1996); Institute of Chartered Accountants in Australia and Australian Society of CPA (2004). In accounting courses educational blogs can be used for discussion of case-study based assessments, for participative learning in a group task and to inculcate problem solving and critical thinking abilities. Woods & Baker, (2004) found in their study that use of group case studies, maintaining group conversations on technical issues and allotting more time and performance grade to online discussions might lead to increased interaction and higher order learning among the student community. To ensure optimal participation of the students in the learning process and the learning outcomes, the accounting lecturer can introduce blogging as a formative assessment exercise or as an independent or interdependent course assessment. For instance, introduction of group based assessment activity which requires students to make their contributions to the completion of a group task or an individual assessment task that require students to post their learning experiences on the blogs to share with others in order to enhance deep learning. A case study group assignment on a Corporate Reporting subject, carrying a weight of 30% of the student’s final assessment grade may be introduced as a group exercise to ensure deep learning and critical thinking skills in accounting. Further, an online interactive assessment can be added to ensure active student participation in completing their group assessment task. The purpose of this assignment would be to assess student skills in reading real world corporate annual reports and relating them to the accounting concepts learnt in their lectures and tutorials. They could select a company listed on the Australian stock exchange and analyse the financial performance of this company and their application of accounting standards in financial reporting. A report could be submitted as an assessment task. For reflective learning and group participation, students could be asked to maintain a blog throughout the semester to contribute and share their learning with other group members every week. 10 % of their final assessment grade could be allocated to blog contributions. In order to maximise students’ sense of ownership and self directed investment in the exercise, the students could be advised to contribute their original thoughts regarding their learning on the subject matter and any additions to the purpose of assessment. They could be told that the principal pedagogic objective of this exercise would be to reflect upon and discuss course content and/or other case study issues that arise out of their learning experiences. Another assessment requirement for this exercise could be to ask students to post their blog entries on a regular basis—at least once a week on average—and to comment on other students’ contributions to relevant issues. A set of criteria would be devised for marking this assessment, based mainly on frequency and consistency of contributions to the activity, response to peer blogs and reference to and demonstrated knowledge of subject content. The student participation in this reflective thinking exercise would promote deep learning and higher order thinking in the students’ approach to learning and provide them with a platform to express their thoughts on corporate reporting issues, critical analysis of financial reporting and the benefits of collaborative learning. Accounting educators can further extend the use of blogs for students to reflect their learning experiences. Students can be asked to blog after each weekly lesson to reflect on their learning in the subsequent week. Later in the course they may be required to return to their blog to post their reflections and write their reflective synthesis on their learning from the course. The online journal environment allows the facilitator to see all the student blogs, comment on entries, and post class messages. The students, however, may only be privy to their own blogs and the teacher’s comments. I could see advantages to having the whole class blogs visible to all students: this happens in the course I am currently studying online. Teachers can use blogs as a gateway to information by archiving class handouts, posting assignments, facilitating discussions, and organizing their course content (Utecht, 2007), due to the nature and importance of blogs as a reflective tool that allows for conversation amongst students and instructors,. It is important to see blogs as tools that allow conversations, course delivery and student assessment rather than merely being a log. The use of these technology supported communication tools such as blogs for the delivery of the course materials and the course information by the instructor along with active student participation for communication and the online assessments helps the educators in achieving the desired learning outcomes. Farmer (2004) also reported that weblogs are somewhat insufficient in their ability to empower the teacher to design and direct cognitive and social processes to reach desired learning outcomes. Thus, the effective use of educational blogs by educators is most important: the educator becomes a facilitator and leader, who will be followed by the students to improve overall learning outcomes. Therefore, teaching and learning activity supported with blogs should be meticulously planned and prepared. Resources to be used, arguments to be proposed and interpersonal interactions to be employed should be planned cautiously beforehand. More specifically, precautions regarding the problems that could occur during the instruction and assessments should be taken into account in advance such as the problems of accessibility and safety of the students (Yavuz and Mübin, 2007). Accessibility may cause a serious problem as all the students may not have equal opportunities regarding the computerised environment and internet access. Safety is another issue which need to be addressed before blogs or other online tools are used for educational purposes. The use of blogs should be integrated into the curriculum in a way that constant guidance and supervision are provided to the students in order to protect them from online predators and harassment. Thus, specific personal information of students should not be published through blogs. As students become more autonomous and constructive agents in their learning process and reasoning, argumentation and problem solving add to their current knowledge and application skills. Collaborative educational blogs and chat rooms, as well as bulletin boards can be used for synchronous and asynchronous interchanges that support seminar-size groups and participative learning. The blog are particularly useful to an educator who is exploring options for online communication between members of the established or potential study groups or assessment groups. The contribution to a weblog depends upon a single person or select group, the likelihood of off-topic or inappropriate topics or responses are greatly reduced as compared to other online communication tools used in education. Hartley (2000) states that the cognitive emphasis shifts then to evaluation and reflection, not only on the results of the discussion and problem-solving activities, but also on the processes and tactics that seemed influential and effective. Hence these reflective inter-group discussions can be useful for problem based learning and critical thinking exercises. Facilitating students to develop into subject matter experts through a three-step process that involves scouring, filtering, and posting. Increasing student interest in the discipline and taking ownership of their learning by searching for information. Promoting participation and enculturating them into a community of practice. Providing opportunities for diverse perspectives, both within and outside the classroom. Blogs as teaching learning tools are not free of limitations. Hernandez-Ramos (2004) investigated the use of educational blogs and online discussion forums in a teacher-training program. Their findings suggested that students were not comfortable as active creators of knowledge and reflective writers on certain issues. Students’ responses to the use of educational blogs were affected by their intrapersonal issues while addressing a larger and unanticipated audience; there was less chances of them accepting blogs as a teaching-learning tool in their academic careers. In other words, participants failed to see how to integrate blogs into their teaching and assessment activities in a meaningful way. Even though blogging helped some introverted students present themselves, teachers needed to identify and support students with insufficient writing skills, less analytical skill development or insufficient motivation to tackle challenging tasks. Blogs have the potential to transform the way teaching and learning activities are carried out by providing autonomy and interactivity with peers and external commentators. They definitely have the capacity to change the way we teach, in turn improving the learning experience for the students. These technology-enhanced journals can ensure that students gain both technological and discipline knowledge. Teachers should use new technologies like blogs and other communication tools by incorporating them into the course delivery approach and for assessment of the performance of students. Limitations of blogs need to be researched before understanding their potential impact on learning. The effectiveness of blogs should be determined through quantitative analysis. Before trying to fit blogs into our academic instruction, it is important to change our pedagogical practices so that the anticipated benefits can be reaped. Blogging can be seen as a useful extension of and complement to existing ICT learning practices in the subject (Farmer, 2006). In particular, it is hoped that the capacities of blogging for self presentation and social interactivity would assist students to forge a stronger sense of personal empowerment and expressive entitlement, on the one hand, and increased connection to a shared learning community on the other. They are an important communication tool for promoting active student engagement and deep learning teaching methodologies that can also be used in informal class discussions and activities, providing for a more relaxed, participative and democratic environment that encourages students to think critically and to express themselves. To sum up, blogs have the potential to transform teaching and learning in accounting education. Alavi, M., Yoo, Y., Vogel, D. (1997). Using information technology to add value to management education. Academy of Management Journal, Vol. 40, No.6, 1310-1333. Bellamy, S. (1996). Ten years of pressure: changing the institutions. Australian Accountant 66(9), 22–23. Bryant, SM. and Hunton, JE, (2000). “The Use of Technology in the Delivery of Instruction: Implications for Accounting Educators and Education Researchers, Issues in Accounting Education. Vol 15, No.1, 127-162. Biggs, J. B. (1989). Approaches to the enhancement of tertiary teaching. Higher Education Research and Development, Vol. 8, No.1, 7-25. Biggs, J (2003). Teaching for quality learning at university, second edition, Open University Press, Berkshire. Burgess, J. (2006). Blogging to learn, learning to blog. In A. Bruns & J. Jacobs (Eds. ), Uses of blogs (pp. 105-114). New York: Peter Lang. International Conference of the Society for Information Technology & Teacher Education, SITE 2007. Davi, A , Frydenberg, M. , Gulati, GJ. ( 2007). Blogging Across the Disciplines: Integrating Technology to Enhance Liberal Learning, MERLOT Journal of Online Learning and Teaching, Vol. 3, No. 3. Ducate, LC. & Lomicka, LL. (2005). Exploring the blogosphere: Use of web logs in the foreign language classroom. Foreign Language Annals, Vol. 38, No.3, 410-421. Dutton, J., Dutton, M., Peery, J. (2001). Do online students perform as well as lecture students? Journal of Engineering Education, Vol, 90, No.1, 131-136. Elgort,I., Alastair, G., S.,and Toland, J. (2008).Is wiki an effective platform for group course work?Australasian Journal of Educational Technology, Vol. 24, No.2. Embrey, T. (2002). "You Blog, We Blog." Teacher Librarian, Vol.30, No. 2, 7-9. Farmer, B, Yue, A., Brooks, C (2008). Using blogging for higher order learning in large cohort university teaching: A case study, Australasian Journal of Educational Technology, Vol. 24, No.2, 123-136. Farmer, J. (2004). Communication dynamics: Discussion boards, weblogs and the development of communities of inquiry in online learning environments. Cited in Akbulut, Y and Kiyici, M (2007), Turkish Online Journal of Distance Education, Vol.8, No.3, 6-14. Farmer, J. (2006). Blogging to basics: How blogs are bringing online education back from the brink. in A. Bruns & J. Jacobs (Eds. ), Uses of blogs (pp. 91-103). New York: Peter Lang. Ferdig, RE. & Trammell, KD. (2004). Content delivery in the 'blogosphere'. T H E Journal,Vol. 31, No.7, 12-20. Harada, V. (2003). From instruction to construction: Learning in the information age. In M. Fitzgerald, M.
Orey, and R. Branch, Educational Media and Technology Yearbook 2003 pp. 40-48. cited in Coutinho, Clara . (2007). Infusing technology in pre service teacher education programs in Portugal: an experience with weblogs. Hernández-Ramos, P. (2004). Web logs and online discussions as tools to promote reflective practice. The Journal of Interactive Online Learning, Vol.3, No. 1. Kember, D. (1996). The intention to both memorize and understand: Another approach to learning? Higher Education, Vol.31, No.3, 341-351. Kember, D. (1998). A Reconceptualisation of the research into university academics’ conceptions of teaching, Learning and Instruction, Vol.7, No.3, 255-275. Lowe, C. and Williams, T. (2004). ‘‘Moving to the public: weblogs in the writing classroom’’, in Gurak, L.,Antonijevic, S., Johnson, L., Ratliff, C. and Reyman, J. (Eds), Into the Blogosphere: Rhetoric, Community and Culture of Weblogs, Available online: http://blog.lib.umn.edu/blogosphere/moving_to_the_public.html. Madigan, D., (2006). The technology-literate professoriate: Are we there yet?, Accounting Education News, Vol 34, No.1, 5-10. Moore, M. G. (1989). Three types of interaction. The American Journal of Distance Education, Vol.3, No.2, 1 – 6. Nasrollah, A. (2005). Factors that may influence or hinder use of instructional technology among accounting faculty, Campus-Wide Information Systems, Vol. 22 No. 4, 210-232. Nelson, A. T. 1996. The future for accounting education: A view from the rocking chair. Journal of Accounting Education Vol.14, No.2: 245-254. Prensky, M. (2001). Digital Natives, Digital Immigrants. On the Horizon. Vol.9, No.5, 1-6. Quible, Z. K. (2005). Blogs and written business communication courses: A perfect union. Journal of Education for Business, Vol. 80, No.6 , 327-332. Shachtman, N. (2002). "Blogging Goes Legit, Sort Of." Wired News. 6 June. Available online: http://www.wired.com/news/school/0,1383,52992,00.html. Singh, P. & Pan, W. (2004). Online education: Lesson for administrators and instructors. College Student Journal, Vol. 38, No.2, 302-308. Sullivan, JE., ( 1996). Teaching financial statement analysis: A cooperative learning approach, Journal of Accounting Education, Vol.14, No.1, 107-111. Trigwell, K. and Prosser, M. (1991). Improving the Quality of Student Learning: the influence of learning context and student approaches to learning on learning outcomes. In Entwistle, N. (Ed). (Special issue). Higher Education , Vol,22, No. 3, 251-266. Trigwell, K., Prosser, M., & Waterhouse, F. (1999). Relations between teachers’ approaches to teaching and students’ approaches to learning. Higher Education, Vol.37, No. 1, 57-70. Williams, JB. and Jacobs, J. (2004). 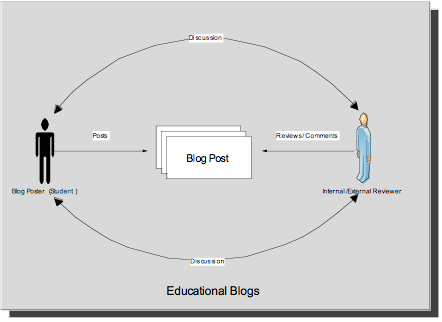 Exploring the use of blogs as learning spaces in the higher education sector. Australasian Journal of Educational Technology, Vol.20, No.2, 232-247. Wilcox, P., Winn, S. & Fyvie-Gauld, M. (2005). It was nothing to do with the university, it was just the people: the role of social support in the first-year experience of higher education. Studies in Higher Education, Vol.30, No.6, 707-722. Woods, RH. & Baker, JD. (2004). Interaction and immediacy in online learning. International Review of Research in Open and Distance Learning,Vol. 5, No.2. Yavuz, A., Mubin, K., (2007). Instructional Use of Weblogs, Turkish Online Journal of Distance Education, Vol.8, No.3.